The Academy of Sport offers a range of introductory basketball, gymnastics and trampoline sessions for 5-12 year olds. 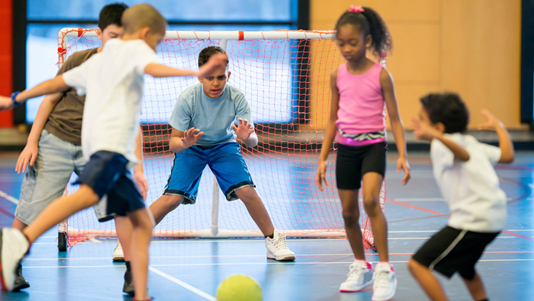 Your child will learn the core fundamental skills to help them develop and progress in their chosen sport. All activities must be block booked for the duration of the term. Junior Gymnastics – Our introductory Gymnastics programme is delivered by a Level 2 British Gymnastics coach. Your child will develop basic floor skills, become familiar with apparatus and work towards building gymnastics routines and achieving badges. Junior Trampoline – Our introductory Trampoline programme will help develop your child’s confidence both on and off the trampoline. The programme is delivered by a Level 2 British Gymnastics Coach, who will take them through the basic fundamental skills, jumping technique and body management. Junior Basketball – Our introductory Basketball programme is delivered by a qualified Basketball England coach. The sessions will focus on taking participants through the key fundamental skills such as dribbling, shooting techniques and passing drills. Why not have a workout in our gym while you wait for your child's session to finish. At a discounted rate of only £2 per session, this is open to all parents/carers or siblings (aged 18+) dropping children off at one of our Junior Activity sessions. For more information, please contact our reception team on 020 7815 7812 or email sportscentre@lsbu.ac.uk.